Learn more about our adventures when we are out Browning Around! I have always felt that a photograph is just a photograph until you here the story behind it. You talk to any photographer about the images they are proud of and I bet they will talk to you for 10+ minutes about each image. Even as I photograph people, there are stories behind the image that I love to share. Could be intimidated by the subject matter, the effort to get there or just what happened as the subject was being photographed. Here is one such image that has a fun story behind it. A month prior, I photograph Joe and Tracy’s wedding reception in downtown Portland. For the first time I had camera issues, location challenges and prop issues. My game was thrown and I was not sure what to do after i built myself up. Eventually I rallied and got through the night, but felt bad I didn’t give them all of what I was hoping for. After I delivered the final product, I asked them if they wouldn’t mind getting back into their outfits and come with my wife and I to White River Falls out in Dufur, Oregon. I was looking for a couple that I could stage a photo shoot and not be under any pressure at all. Where I could slow down and direct the scene how I wanted. In return they would have a fun time and get some photographs they would enjoy. They were such sports and we switched between formal wear and casual dress. We even enjoyed some Buffalo Trace and Flaming Hot Cheetos for our efforts. We used the river, the waterfall, the drone and the pump house as backdrops. At the end of the day it was so nice to slow down and enjoy the moment and set a photo like this up. I was balancing on a railroad tie about 8ft above the ground. I told them to dip for a kiss and just be themselves. No real instruction as I wanted it to look natural. We got natural and a beautiful image for them and my portfolio. This really taught me to be more of a director; afterall my customers are paying me to play the role of director and photographer. The photos from this day have taught me to have a different approach to my engagement sessions and senior portraits. Silver Star Mountain - Wow! Natalie had researched Silver Star Mountain hike for a little while. Silver Star is outside of Battle Ground Washington and with traffic I think it is about a two hour drive from Portland. We knew it was something we wanted to do for sure, but there was a challenge just getting to the trail head. Road #4109 was in bad shape and required a high clearance vehicle to get to the trailhead. But how bad could it be?? It isn’t always smart to go alone on a challenged road incase you run into an issue. But nothing ventured, nothing gained and we had beer and each other. Looking back from where we came up the trail. This was a hike I wanted explore later in the day to perhaps catch a sunset. We picked a day during the middle of the week and planned to leave early to get to the trailhead around 3pm or so. After battling Portland traffic we arrived at the high clearance road. As we climbed we saw someone in a Honda Accord trying it. Seemed odd to me based on what everyone was saying on social media. Wasn’t long and I realized he was going to get very far at all. The road was washed out, big boulders and certainly took patience to climb in my Tacoma. The road was just 4 miles long, but it felt like it took forever to get to the top. We arrived at the parking lot and found only one other vehicle, so we knew we would have the mountain to ourselves. The hike to the top has two routes. One is a steady climb and is on the west side of the mountain. Almost like a fire service road all the way to the top. The more eastern route is probably the best route. It took us through some beautiful wild flowers and green grass to a rock arch we passed through. We also had a view or Mt. Hood as we traveled. There were a couple of steep traverses that required all 4 appendages and some focus, but nothing too bad - it was a long way down. Once out to the clearing you think you must be near the summit, but you still have some trail ahead of you. The trail takes you around the mountain and back into the trees for a short stint. You then climb up a fire service looking road to the top. Once at the top you have 360 views and you can see all the mountain peaks. My mistake was just hiking in a tee-shirt and not bringing a coat. There was a cold wind blowing that day, plus a cold Citrus Mistress I was shivering a bit. We knocked out our photos and dropped down in elevation just a little and the breeze was gone and I was perfect temp. As we got down to more of a plateau and the west facing trail I launched the drone to get some aerial shots of the mountain. The sun was starting it’s sunset show at this time and the video and stills from the drone were amazing. I felt like we were on some Austrian mountain and not in Battleground Washington. We sat and enjoyed the sunset with a little Fireball, but now it was time to beat feet and get back to the truck. I did come prepared with a flashlight and headlamp, but we did have some thick overgrowth to walk through. Flashlights were not going to show if something was lurking in the trees. I certainly had a quick pace back to the truck and when we arrived at the truck we still had a band of sunset glow and city lights on the horizon to watch. Silver Star Mountain is an excellent hike and only about 50mi from Beaverton. There are two routes to get there and one is vehicle friendly and the other one is not. Bring supplies and notify friends if you take the high clearance trail to the top. There are no services around for some distance if you should have a problem. Try to get a sunset hike in and enjoy the views as they are outstanding. We decided to spend a couple of days in Hood River and get in a couple hikes before we head north to Bellevue for the Christmas holiday. We had looked at going to Cougar or down to the southern coastline, but decided the shorter drive after work and snow was what we wanted. Thursday after work we headed out for the slow drive out I-84E to Hood River. But this drive was much better than the +4hr drive down to southern Oregon like we planned. Natalie booked a familiar hotel for us to spend a couple nights in. We don’t ask for much and really just need a place to feel safe and hang our coats. The Sunset motel seems to be perfect for us. Only a mile from down town Hood River, just off the freeway and right across the street from a Safeway and other stores. The room isn’t big, but enough room for us to spread out. The weather was not supposed to be great in the afternoon so we weren’t sure how to spend our Saturday afternoon. We wanted to go somewhere with a view of Mt Hood and maybe not too many people. We settled on Chinidere Mountain; a hike we have done during the summer with some amazing views of hood and the forest below. We thought there might be a light dusting of snow, but nothing we couldn’t hike through. We arrived on FSR 1310 and began to ascend. There was a sign mentioning that there was “no winter maintenance” on the road ahead. With a lifted 4x4, I wasn’t too worried about the road. Our first obstacle was a rock slide that threw some rocks and boulders onto the road. We took a few minutes to clear out the worst of the rocks and boulders and then pressed on. We then started to hit snow, which got deeper as we ascended. As we trail-blazed and the snow got deeper the truck started to hop and bounce around. The truck was working harder to get through the snow and I started to question if we should try and go another 2.5mi in the snow to the trail head. The only tracks in the snow were from a fox and my Goodyear tires. This meant we were alone! Great for the solitude and quiet, but not so good if we have a breakdown or get stuck. It was time to pause and come up with a new plan. Looking up towards where we would probably be hiking, the clouds started to roll in and we would not have a great view from the top. On top of that I didn’t bring a sweatshirt or something to wear under my jacket, so I would have been cold the whole way. Our new plan was to get out the Walmart Christmas onesies, crack a beer and take some funny photos. I had this idea in mind of story-boarding the photos when I shared them on social media. I tried to craft them around a naughty elf breaking into my cooler. Having fresh snow and the place to ourselves we had a blast. We ended spending 2 hours goofing around. This was an unplanned spontaneous afternoon in the snow with Walmart onesies and had a blast. We seem to always structure our outings and they are pretty much predictable. But days like this are my favorite; where we make something out of nothing. These are probably some of my favorite goofing around images that we have done. So, get out there and don’t be discouraged if everything doesn’t go as you planned. Sometimes those unplanned afternoons are the most memorable. We followed up the Tam McArthur Rim trail with the Metolius River trail on Sunday. A couple years ago we had a hiking adventure from trailhead following the river downstream to the hatchery at Wizard Falls and then back to the car. This time we drove to Wizard Falls at the Hatchery with the thought of getting a photo of the blue water that flows under the bridge and then go see the fish at the hatchery. Such a beautiful drive through Camp Sherman down to the hatchery. The area was empty and so there was no traffic to distract me as I drove us to our destination. The weather was having some fun with us. Sprinkling on and off with the sun and blue skies poking through every now and then. The question became do we bring the rain jackets or not. Ultimately being from the Pacific Northwest, we erred on the side of caution and brought our coats. Seemed like we would put them on and then the sprinkling would stop. Take them off and then it would start sprinkling again. Our hike took us upstream a mile or so in search of some fly fisherman. I really wanted to photograph fly fisherman out in the river. I was rewarded on this trip with 4 fishermen on various parts of the river. Although I was happy to exercise my 24-70mm 2.8, in some instances I wish I brought my other heavyweight the 70-200mm 2.8. I needed a little reach through some of the tree branches. Regardless I was not disappointed by what I put into the can. Hiking off season has some benefits – no crowds. We probably saw a total of 10 people on the trail system. There were a few more visiting the hatchery, but that was it. Once we returned to the hatchery, we decided to keep hiking and exploring down the river. Neither of us had done the whole trail and the weather was looking promising enough. I believe it is 6mi roundtrip from Wizard Falls. You hike down one side of the river and then cross the bridge to travel upstream on the other side. Downstream we found a couple fisherman that I could get a good angle on and photograph. 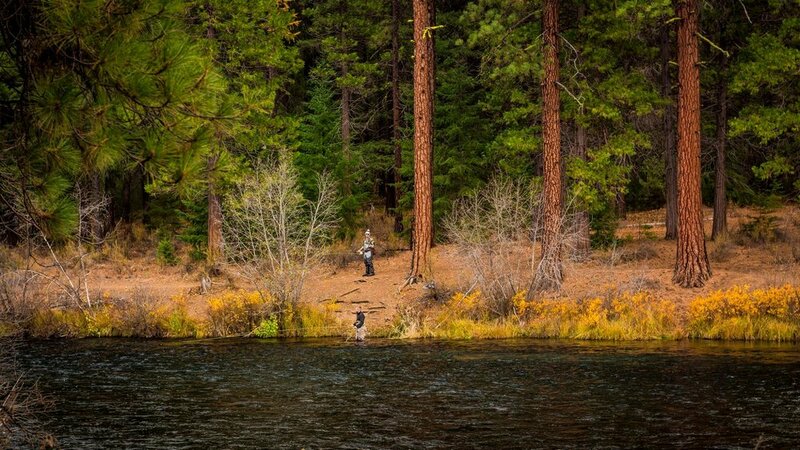 I was in photographer heaven because of the fall colors still hanging around, the peaceful nature of the Metolius river and catching people out doing what they love – fishing! Once back in the car we saw the large dark cloud that was hanging over Hwy20 and our route home. Although I was grateful it held off on dumping on us on the trail, I knew we were in for a long ride home. Sure, enough the heavens opened up and the wipers were on full speed. Thankfully we had to slow our pace due to a severe accident near the junction of Hwy20 and 22 involving 4-5 vehicles. Honestly, I wasn’t looking forward to driving down the curves in the pouring rain. A lifted truck with knobby tires doesn’t instill confidence around wet corners. Thankfully we made it home in good time and in one piece. I really am glad we took the time to explore down stream and enjoy the fall colors. We were thinking of hitting a trail on the way home instead. But we would have missed having the river to ourselves and being able to enjoy those lasting fall colors. If you go bring a few quarters to feed the fish in the pond. It is fun to see all those fish swarm to the food.